The DJI S800 EVO is a revolutionary HexaCopter platform designed with the high end aerial photographer in mind. 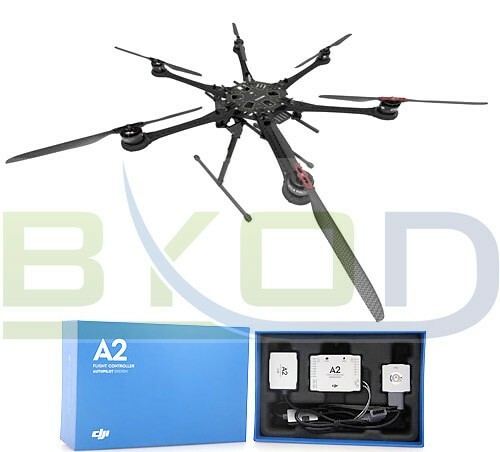 The S800 EVO HexaCopter kit is supplied with the DJI A2 M Flight Controller, the retractable landing gear is also included in the kit and allows a the full 360 degree (Yaw) view from the camera without the view being obstructed at any point. The S800 EVO has 6 powerful (500 watt) brushless motors fitted with 15 inch carbon fiber propellers allowing for increased payloads to be carried with ease due to the strong and stable power system. The S800 EVO is very efficient and has power in reserve to ensure responsive flights. The S800 EVO is the most durable HexaCopter to date from DJI innovations to combine both portability and the greatest level of stability.